Get continuing nationwide collegiate enrollment and degree information on your institution’s current students, former students, and admission applicants. Available for free to eligible institutions. 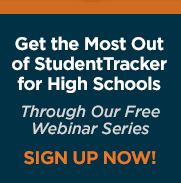 Follow your high school graduates’ transition to postsecondary education anywhere in the U.S. and accurately gauge the effectiveness of your college preparation efforts. Measure the college success of your outreach program participants at colleges across the U.S. and simplify your federally-mandated performance reporting. Our Research Center provides student outcomes data and more to higher education institutions, states, school districts, and educational organizations.